Take a classic 1991 Bounder motorhome, add a guy with welding skills and a lot of guts and the outcome: A remodeled motorhome with a new slideout. Presented as a slide-show, this multi-week project (poor guy lost track of how much time he had in on it), you'll find this either something that will make (most of us) run screaming away, or for the intrepid few, start scratching their heads on their own remodel project. Follow this link (sorry, author won't allow a direct imbed) to the 10 minute plus show. Excellent! 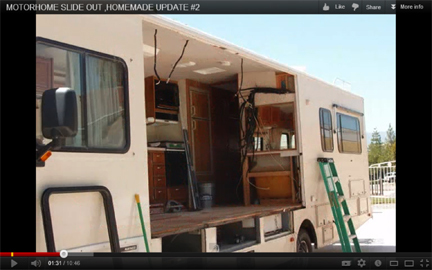 I bet you could teach the RV manufacturers a few things. When you get tired of welding and gluing, become a consultant to those guys.